1% economic growth = $300 Billion of federal revenue. 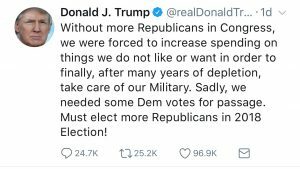 Let me be the first to say it, the new spending measure by Trump & the GOP may BALANCE THE BUDGET. 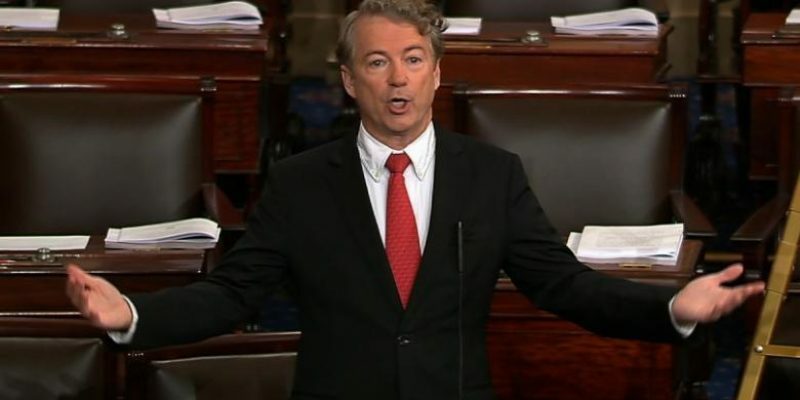 Rand Paul kept the Senate wide awake on Thursday night, grandstanding to lament what he called a $1.2 Trillion annual deficit predicted by this new bi-partisan spending measure. But who predicts the deficit? The CBO. The CBO has based its revenue projection off their usual static scoring, presuming a pessimistic 2% growth (apparently for the upcoming millennium). Conservatives, like Rand Paul, have complained about the CBO’s “static scoring” for years, which refuses to take into account how economic factors can increase growth, and with it revenue to federal coffers. You know…. like the greatest tax cut in America since 1986. Liberals used the same faulty CBO projection and static scoring, a few months ago, to proclaim the Trump Tax Cut would add $1.5 Trillion of debt to our nation over the upcoming decade. Rand Paul knew better then. He voted for the tax cut. Each 1% of economic growth provides about $300 Billion in federal revenue. Americans are enjoying 5% GROWTH in the first quarter of 2018. But Rand Paul, and his allies in the Freedom Caucus, are pretending that the anemic 2% growth of the Obama years will remain the norm. Apparently, CBO scores are only adhered to at the convenience of the politician. But the hard truth is, you cannot provide three week long funding measures to a U.S. Military in desperate need of equipment overhauls. General Mattis is winning in Iraq and Syria. When is the last time you heard about ISIS on the news? That’s because they barely exist. New threats are on the horizon. Don’t expect Trump or Mattis to show their cards on their future plans either. That reminds me, have you seen the Winter Olympics? 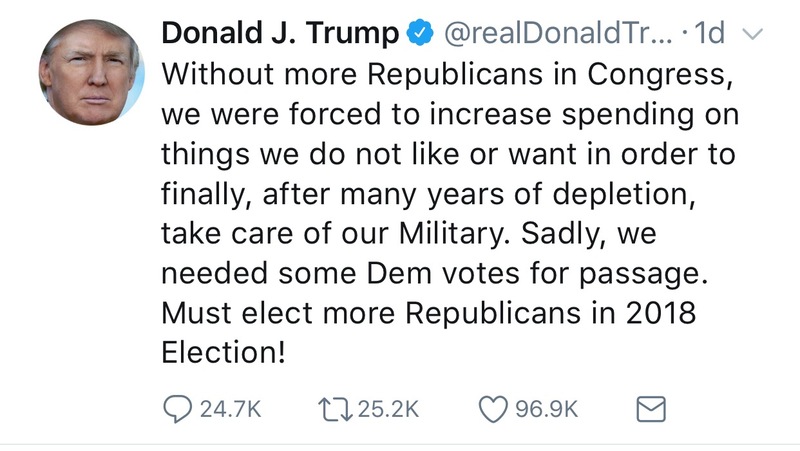 Republicans also needed to take the “budget shutdown” threat off the table from a crafty Chuck Schumer and Nancy Pelosi. The GOP was lucky to win the messaging war on the DACA shutdown in January. The Democrats picked the wrong issue to bargain with. Now, Republicans can get through the midterms without shutdown games. Conservatives should celebrate. Immigration reform is next up. A huge win on that for Trump will weigh heavy in November. The Wall matters. The Democrats are now forced to vote on immigration legislation, for grown ups, without being able to hold the budgeting process hostage. That cost Americans $68 Billion – the cost of 60 votes in the Senate. Making sausage is ugly, but Republicans are getting better at it. If 5% growth continues for 2018, the deficit would be “cut in half”. You’ll see that on political flyers from Freedom Caucus Members in November. Mark my words. As far as Democrats go, where were all these budget hawks on the Left when Obama and gang clocked in a total of $2.8 Trillion in deficits in just TWO YEARS (2009, 2010)? They were probably out picking cherries. Any notion of this new spending bill creating a trillion dollar deficit is just absurd. Cherry picking CBO scores to match a political narrative should be a tactic left to Democrats. Senator Paul is a good American, but he should know better.